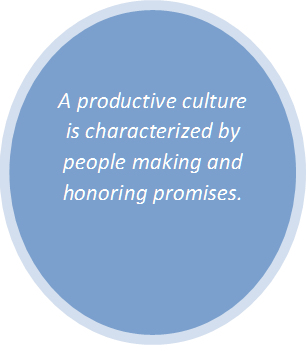 A productive work culture is one that is characterized by people making and honoring promises. What does that mean? It means that leaders on all levels learn to make requests and obtain promises that can be managed. They no longer manage people; they effectively coordinate action by managing peoples’ commitments. The rigorous practice of “requests,” “promises” and “complaints” creates an environment of integrity where things get done and people’s emotions enhance their performance rather than interfere with it. The foundational principles of this work are summarized in our book Who Will Do What by When?, which serves as a roadmap for operating in integrity to enhance performance, trust and organizational results. Similar to the benefits of upgrading your computer’s operating system, we work with you to enhance your team’s reliability, capacity and speed. The new “interpersonal operating system” provides a platform for sustained excellence. The first step to create a healthy culture consists of taking its vital signs. What is the temperature of the current culture and how is it enhancing or hindering performance? What is the pulse of the organization? At what pace are things getting done? Where is the organization relative to its goals? How balanced or harmoniously are the various departments working together? What is the organization doing in excess and what is it deficient in? The next step is to define which cultural attributes will be most effective in supporting your business strategy moving forward. We then work together on setting goals, shaping the behaviors, processes and systems that will build the desired culture.